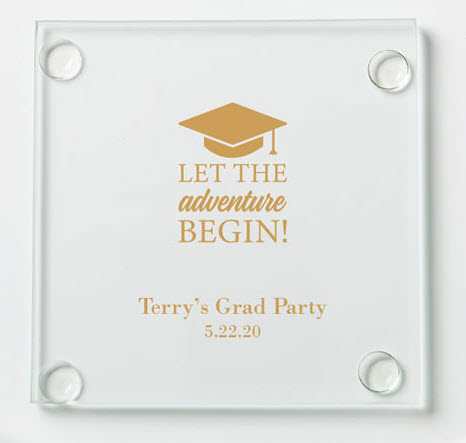 With our design your own coasters, personalized graduation favors are so affordable. This is a square glass coaster measuring 3.5" with rubber feet on the bottom. Your personalization choices are silkscreen imprinted. The coasters will arrive bulk packed; however you can order white boxes for $.50 each. You will need to assemble the box and insert your coaster and then finish with the peel and stick bow. This was my first time to order from your company, and this is my 50th Class Reunion, and I am so happy they turned out beautiful. On Oct. 14th is my reunion and I just can't wait to get the feed back on these favors. I thank you so much, they look very expensive, well made, and was just what I ordered. I will use your service again!